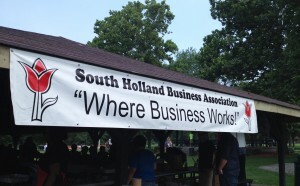 Whether it be advertising your business or promoting an event for a local school fundraiser, a popular option to get your message across is a banner. With the warmer weather approaching, there will be a great need for them for outdoor advertising. Well, what kinds of banners are there? I’m glad you asked! There are a few different types of material that we stock and each one has a certain environment for which it can be used. 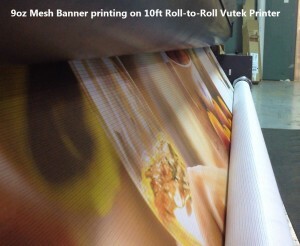 9oz Mesh Banner – This kind of banner is perfect for indoor or outdoor use. Its lightweight, fire retardant material is ideal for covering construction fencing and does not cause any unnecessary noise since the mesh allows for wind to blow through it. This banner prints one-sided and can be installed over windows without blocking visibility. 13oz Vinyl Banner – The most popular banner choice for its durability, inexpensive cost and versatility. 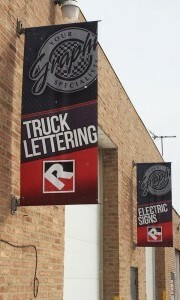 It is perfect for larger, outdoor banners up to 10 feet wide by any length (although it can be used indoors as well). This material is also popular for tradeshow graphics, retractable banner stands or temporary event banners as it prints one-sided. 18oz Vinyl Banner – The most durable of materials, this matte blockout vinyl banner prints double-sided and can hold up under the worst weather conditions. It is perfect for avenue pole banners, street banners or hanging stage or arena banners. Need a different material? We can custom order anything that you need. See a full list of our stocked materials here. Call us today at 800-829-3021 for a quick (and free!) quote on your next project and get a head start now that spring is here!